The exterior view of IK LAB. Photo by Alice Rabbit © Alice Rabbit, Courtesy of Azulik. 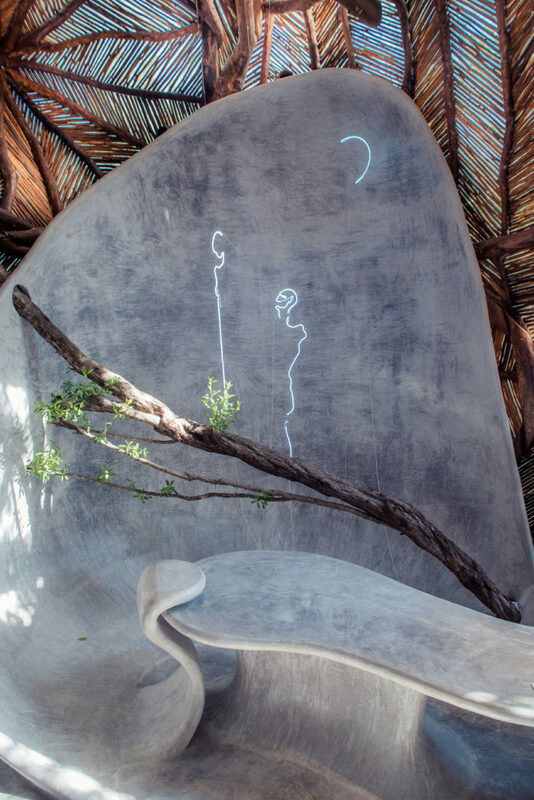 IK LAB is a singular creative space located inside of Azulik—a breathtaking eco-resort in Tulum envisioned by self-taught architect Jorge Eduardo Neira Sterkel. 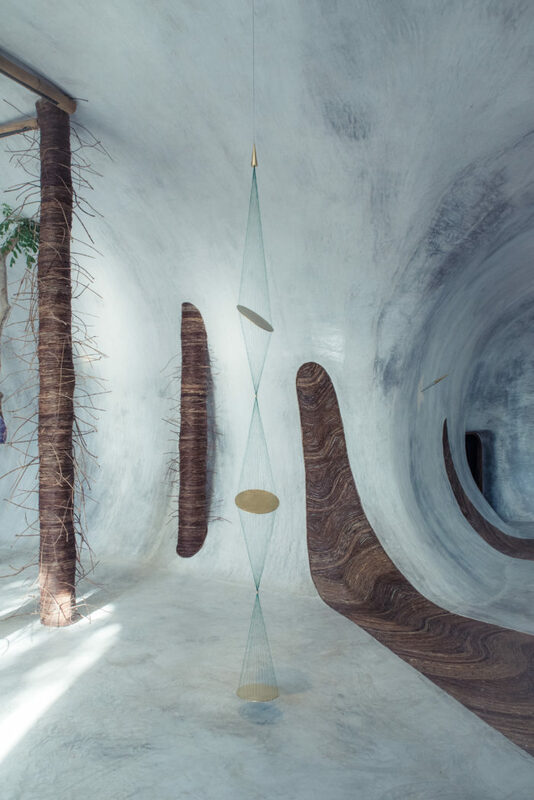 Born from a collaboration between Neira Sterkel and gallerist Santiago Rumney Guggenheim, IK LAB can be interpreted as both a gallery and a temple through its monumental form, built exclusively by local Mayan craftsmen. 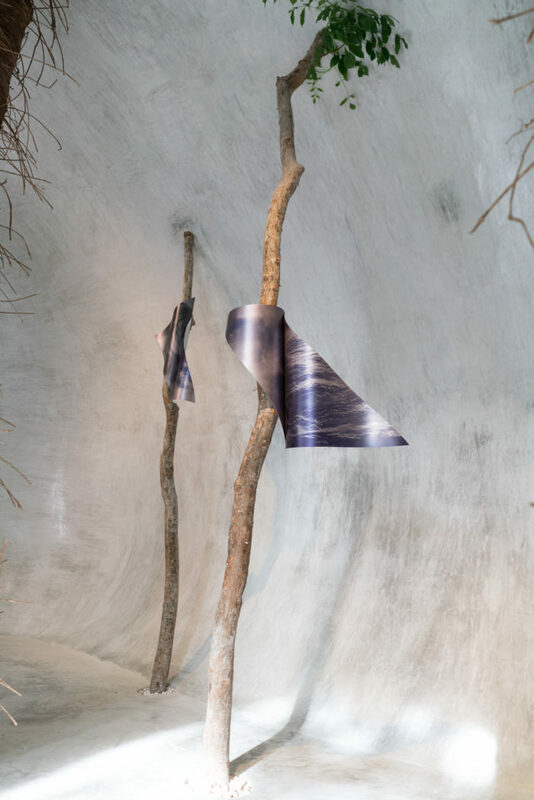 Seeking to bolster the bohemian beach town’s contemporary art scene, Neira Sterkel and Rumney have designed an art experience evocative of an ancient ritual, with visitors asked to remove their shoes before entering in order to physically and energetically connect with their surroundings. “This gallery is the first step to really begin a relationship with the art world,” explains Neira Sterkel while sipping on aqua de flor de Jamaica, a popular Mexican herbal tea during our interview in the nestled resort on Carretera Tulum Ruinas. His commitment to sourcing only materials that are in complete harmony with the abundant greenery has manifested in the sacred space that Azulik and IK LAB lay on. “In the last three years, things became very interesting because I began working at the rhythm of the Mayans, really listening to them,” he says. Now, the architect devotes considerable efforts to spreading sustainable construction and energy solutions informed by Mayan teachings. Margo Trushina’s Being Human Being, 2016. The partnership between Rumney and Neira Sterkel was an unexpected happening. After visiting the unoccupied, and until then, undesignated, space late last year, Rumney sent Neira Sterkel an impromptu proposal for the project that would become IK LAB. According to Rumney, “there had been previous activations in the space. But when I walked in, I knew that 2018 was throwing this project at me.” The two had never met, but within hours of sending the proposal, and minutes before boarding his flight back to New York City, Rumney received a response from Neira Sterkel, who agreed to the project on a whim. Breaching the traditional limits of the white cube, the dynamic architecture of the gallery becomes an activated element in the viewing experience. With its smooth, concave walls, and free-floating artworks, IK LAB echoes the design of Art of This Century, the revolutionary Surrealist gallery where Rumney’s great grandmother, Peggy Guggenheim, showcased some of the world’s most groundbreaking artists in the 1940s.